The Sustainable Living Education Trust operates independently to gather and publish useful information - it's the practical stuff you need to know, to make a difference, and take action where you live. We know that you are thinking about change globally whilst your action has to start locally, at home, in your community and workplace. Free info is on our Actions page. The downloads area holds our detailed 'Future Living Skills' Learning Guides on each of eight topics. Registered site users have access by password, which is issued free within member district council areas: look for your district page. (or if not in a current member district, there's the individual subscription option, at $39 per year, arranged by email to rhys@sustainableliving.org.nz ). We start with easy, no-cost actions, then propose small investments that can pay for themselves, such as energy efficiency to cut power bills. Then we move on to the bigger challenges. The big ones apply when moving home, changing a vehicle, renewing domestic appliances, raising babies, renovating a house and deciding if and where to fly abroad. We aim to help you move towards lower-carbon living and reduce your waste of scarce resources, whilst keeping a good quality of lfe. You will feel good when these choices also save money and support better health. 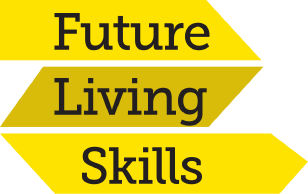 Our community education is focussed on 'future living skills'. Explore this theme more by Liking 'FutureLivingSkills' our new Facebook page. (There is a Facebook feed embedded on this page). Might this be your new career? Sharon, pictured here, joined one of our classes when a University of Canterbury student and went on to work at the University promoting sustainability for other students and Departments, on projects such as 'Eco My Flat'. Now she works professionally in waste minimisation. Perhaps you will make sustainability 'what you do for a living'! We can help you to understand and record your carbon footprint, in partnership with Enviromark-CarboNZero, and to understand other aspects of your environmental footprint, whilst keeping your well-being and quality of life in mind. Just browsing home sustainability issues? If you'd enjoy exploring a range of home sustainability questions on-screen, perhaps to see how much you know about the basics already, try our household Quiz then maybe go to this site's Issues page. Note that now subsidised high school-based evening classes are less common, local learning groups or privately-hosted classes are the easiest way to take part: described here. You could host or lead one! Our learning guides are interesting for a solo reader but designed for use by groups and learning is more fun done that way.